-The Dearth Community Center is a spacious 14,635 square foot building that will accommodate up to 800 individuals. -The Dearth Community Center welcomes its guests with a spacious foyer that offers private entry into either the small or large conference rooms. These conference rooms are available for lease or combined, depending on your needs. -The Dearth Center boasts a commercially designed, fully equipped, Health Department approved kitchen with two portable bars available for your use. -The dance floor is centrally located and accessible from both conference room areas. A portable stage and state of art sound system are also available upon request. 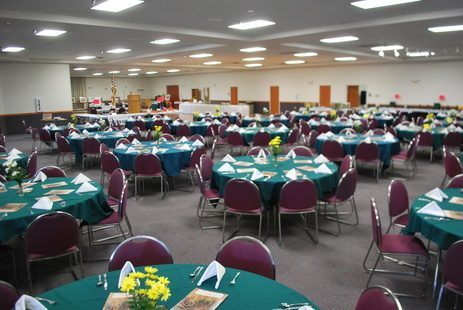 -Large round tables and comfortable chairs add an elegant touch to your dining or conference setting. -The Dearth Community Center is located on the southwest corner of the Branch County Fairgrounds. It offers private paved parking area to accommodate your guests. -This building was made possible by the initial donation of the Dallas & Lucille Dearth Family as well as numerous donations and contributions of businesses and individuals within the community. Facility holds up to 600 people in a round table set up and up to 800 people in stadium seating arrangement.